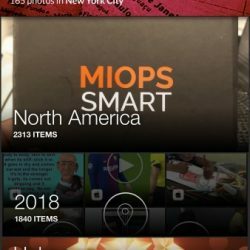 REVIEW – While I love my iPhone 8 Plus, I hate paying so much money to get the version with the most storage memory. It would be much easier to have all of my pictures stored on a drive and to have access to them whenever and wherever. The Kwilt Shoebox Mini smartphone backup adapter claims to be able to give me exactly what I want. Let’s see!! 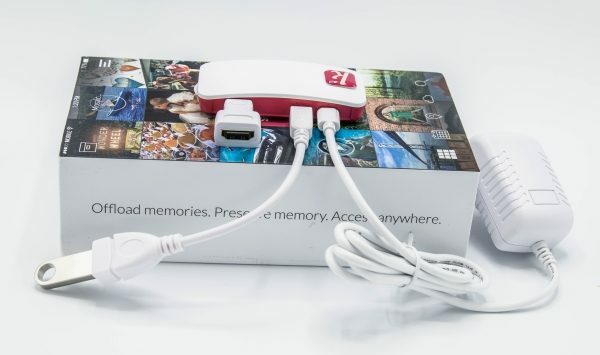 The Kwilt Shoebox Mini backup adapter, allows you to offload your photos and videos from your phone or tablet, and have access to them and any other media attached to the shoebox from anywhere in the world and at any time, as long as you have internet access. 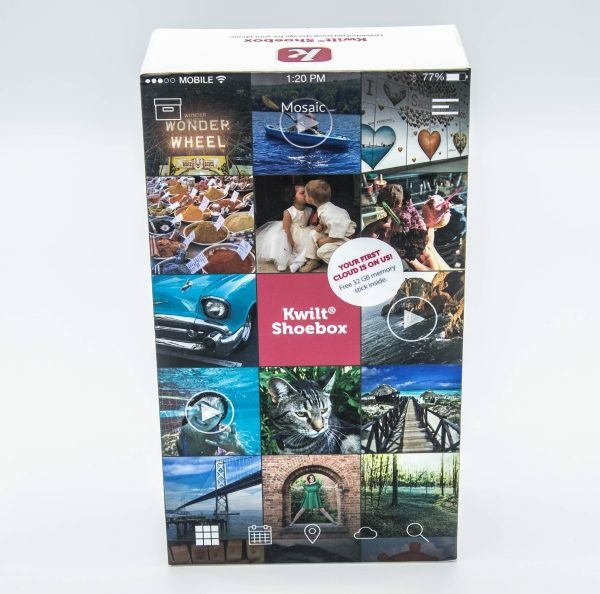 The Kwilt Shoebox is a small and lightweight device that allows you to connect a relatively limitless amount of hard drive storage and apart from offloading your pictures and videos from your mobile device to “free up” storage, you have access to the content from anywhere in the world as long as you have internet access and the app configured on your device. 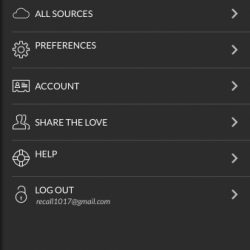 You can set up additional accounts for family and friends and others. 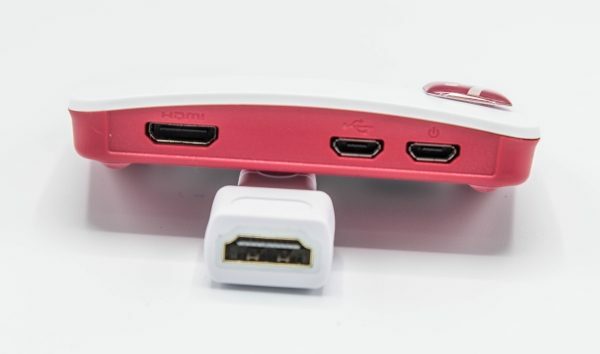 On the back of the device, from left to right, there is a mini HDMI port, a micro USB data port, and a micro USB power port. The picture below shows how the cables are connected. 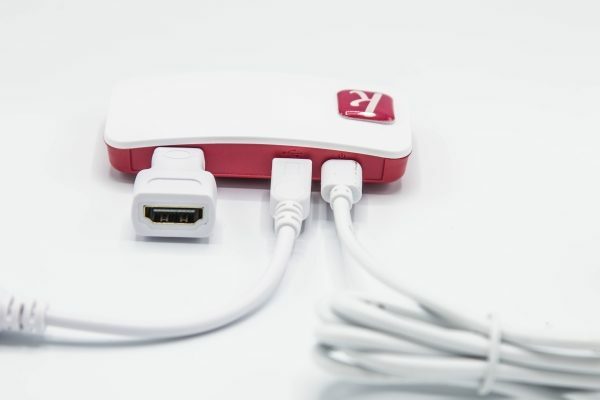 With the mini HDMI to HDMI adapter, you can attach to a TV or monitor and view the content stored on the shoebox. You can connect a thumb drive to the micro USB to USB dongle as shown below, or you can connect a USB hub with multiple drives. 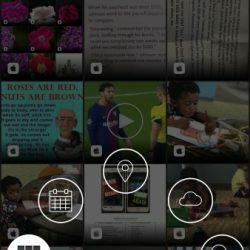 Once you sign in to the app, there is the main screen that displays some of your photos and videos as a background, with the options overlayed. In the upper left corner, there is an icon that looks like a large shoebox. 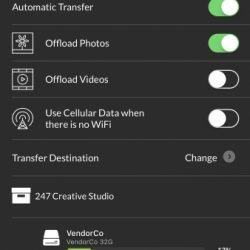 Selecting this icon takes you to the options to transfer your photos and videos, as well as to set your preferences. Below are pictures of some of the screens. (Not all of the screens are included in the pictures. 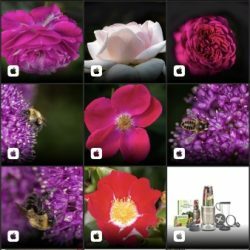 There are too many to show, but these should give you an idea). 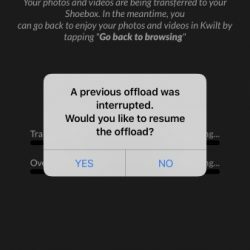 When I selected the option to transfer my photos and videos together, the app crashed every time without completing the task. Eventually, I selected just the videos, and those transferred successfully. At that point, I figured that it was no big deal, and I would just transfer my pictures separately. However, no matter how many times I tried, the app crashed and I had to try again. Despite my efforts to reach their customer support by sending multiple emails via their in-app email, I never received a response from their customer service. However, I decided to try the app on my iPad and everything worked. 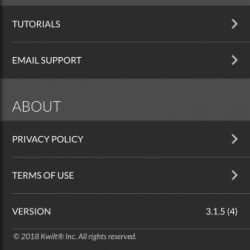 After taking a closer look at what was happening, and comparing my iPhone settings with my iPad, I realized that the Kwilt app does not run in the background if your phone is set to auto lock and if it goes into that mode before the transfer is completed. I find this strange and quite inconvenient since unlike my iPad, I set my phone to auto lock after 5 minutes for privacy and security reasons. 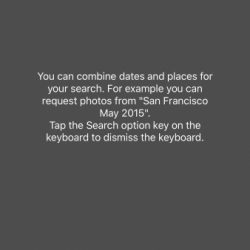 The solution here for the first transfer that included a large number of photos was to disable the phone’s auto-lock feature, and then the transfer was successful. 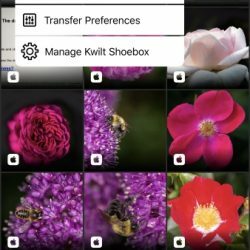 The Kwilt Shoebox can also be set to perform automatic transfers one your device connects to the same network that the Kwilt is on. 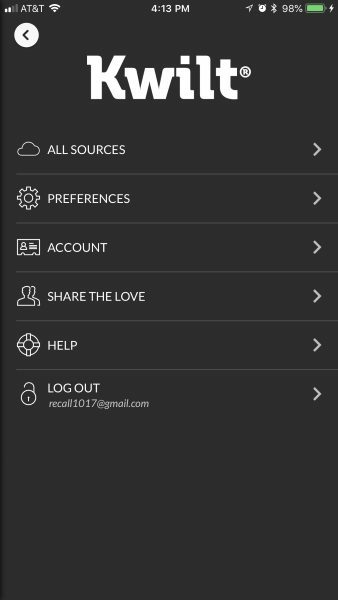 The last icon to the right is the settings icon that provides tabs to additional setup options, preferences, account information, help options, social media sharing options and the Logout option. 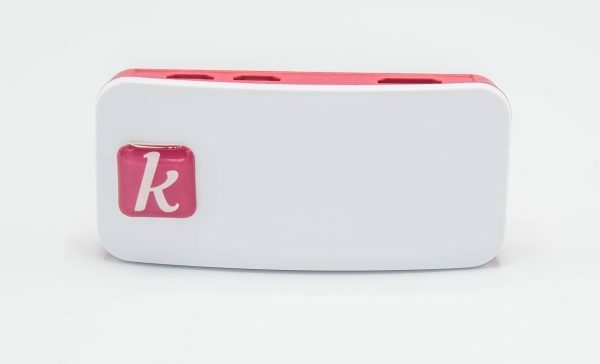 I like that the Kwilt Shoebox is small and lightweight, and uses a wireless connection so that you can place it just about anywhere. I also like that you can attach a drive of any size including a thumb drive, and even a USB hub with multiple drives. This makes the storage virtually unlimited and provides the ability able to accommodate just about anyone that you want to share access with to store their files as well. The incremental automatic transfer once your devices and Kwilt are connected to the same network is also a great feature. The app needs some work, since it crashes (or just stops working) if the device goes into auto lock mode during the transfer process. Without a doubt, customer service/support/response must be improved. 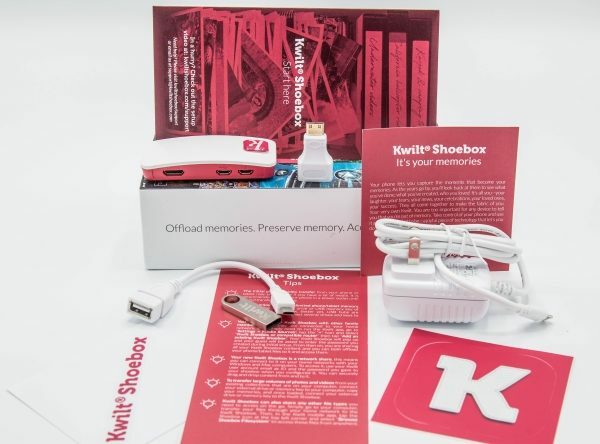 The Kwilt Shoebox is a really nice device that is designed to perform a very useful and convenient function. 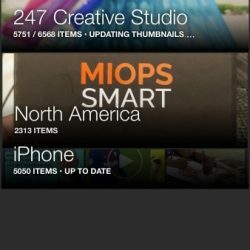 It provides for virtually limitless storage for your mobile picture and videos, far beyond the built-in storage capacity of any phone on the market today. What is even nicer, is the ability to allow access to others of your choice. This is a much-needed device that would serve many people very well. Once I figured out the issue with the auto lock, this device became a permanent and convenient asset on my network. Where to buy: Kwilt Shoebox Website and Amazon. Source: The sample for this review was provided by Kwilt Shoebox. Isn’t it a Raspberrypi Zero? It does use a form of the Raspbian OS.